In the 1850s and 1860s the New Zealand provinces assisted many people to emigrate from Britain and Ireland. In the more English provinces of Canterbury and Wellington there was some opposition to providing assistance to the Irish. 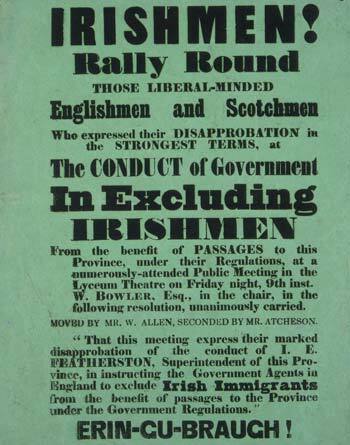 In October 1857 it was reported that Wellington Superintendent Isaac Featherston had instructed Wellington province agents to exclude Irish immigrants from assisted passengers. This led to a public meeting of protest, and this leaflet.